Soups are the perfect way to start a meal, whichever country you are in. They not only introduce you to the regional flavours, but also tune up your digestive system in anticipation of the meal to come! 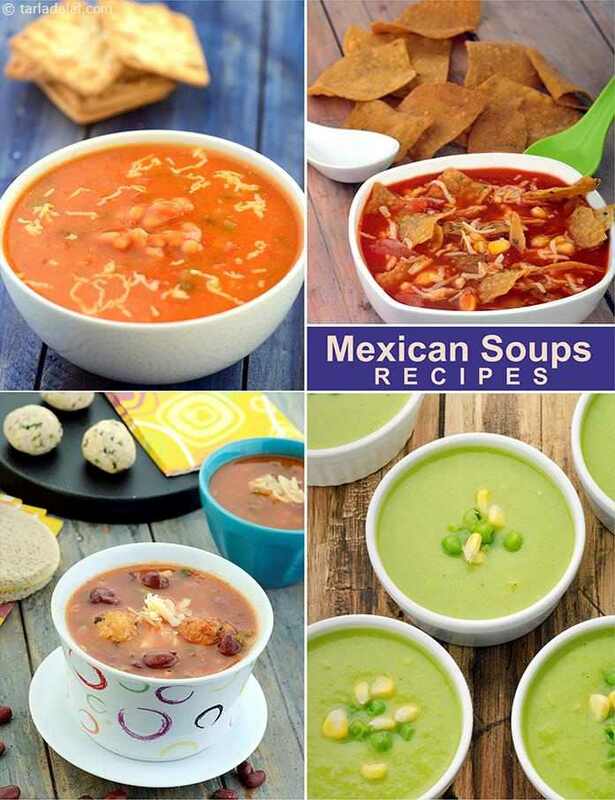 Mexico has a vibrant spectrum of soups like the Black Bean Soup, Chilli Bean Soup , and Mexican Tomato Soup with Cottage Cheese Balls. Subtly flavoured comfort – that describes this traditional Mexican Black Bean Soup best of all. Prepared easily with a pressure-cooked blend of black beans and other ingredients, the Black Beans Soup is a wholesome dish that you will love to slurp up. Green peas are cooked, pureed and then mixed with corn to give a delightfully mild flavoured soup. Enriched with the goodness of kidney beans or rajmah, the Kidney bean soup is great in texture and taste,. The beans are boiled and then blended with tomato puree and celery and then served hot with croutons.